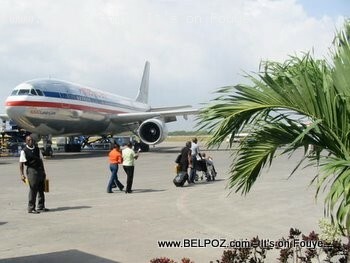 "Starting in September, " President Martelly says, "you wont have to go to Port-au-Prince in order to fly American Airlines..."
According to Cap-Haitien International airport coordinator Joseph Larosiliere work is being done at the airport accommodate a plane carrying up to 200 passengers. This work also include the enlargement of the arrival gate at Cap-Haitien airport. So fat I have not read any official press released from American Airlines but I am waiting impatiently for the inaugural flight. IT'S ABOUT TIME. ALL THE STRESS AND THE COMMOTION THAT WE GET FROM THE PORT AU PRINCE AIRPORT WILL BE OVER. THIS IS ONE OF THE BIGGEST INVESTMENT IN THE HAITIEN HISTORY. I think it a good move from the Haitian government. It is part of the vision you have for the country. It is very important for decentralization and we will take advantage of the convenience. When I heard the news, I did call American Airlines to confirm; nonetheless, the person I spoke to claimed that she did not have any info about it. So do I, I am waiting impatiently for the inaugural flight. I can guaranty you that I will be in the first flight. My brother just forwarded me the text the government sent out today in everyone's mobile phone. I am saddened why " The President" didn't announce for one in Gonaives, the "independence City" as it is known and which would have been most fitting.